We seem to be always waiting for something in this life…waiting to grow up, waiting for a spouse, waiting for a baby, grandbaby, waiting to retire, etc. Each hour of each day for every year of our lives we wait in traffic, wait in line, wait to hear about a job, a decision, a prayer request or something else. Some days we are waiting to get somewhere, to get something or find out news. We wait for good news, bad news, and sometimes we are just waiting, waiting, waiting for ANY news! Life as a stay-at-home mom or hard-working professional can be tough and we’re just waiting for the day to end. Some nights are torturous as we’re waiting to see what the morning will bring. But what happens when whatever it is we’re waiting for drags on for longer than just the hours of the day and night? What if our waiting lasts days, months, or even years without an indication of when the wait will end? And what about the ultimate wait, more than just days, months and years, but a lifetime of waiting for that final release? As Christians, sometimes this waiting can be the most long and tiresome wait of all. Our weary souls long for heaven’s rest and to be reunited in eternity with our Maker. Like Paul wrote in the New Testament, “We grow weary in our present bodies, and we long to put on our heavenly bodies like new clothing.” (2 Corinthians 5:2) I yearn to shed this tired, flawed body and leave this sinful, tragic world to experience the perfect life He intended for us in His presence. With all this waiting and our impatience to get where we’re going, to see what we want to see and have the release from this life that our soul longs for, is there a way to have peace in the wait? 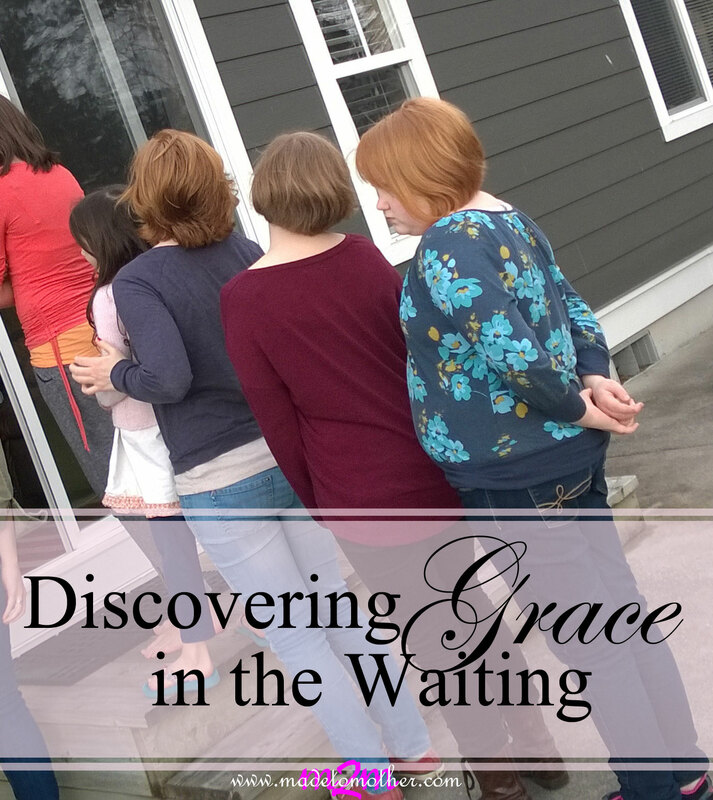 To see God’s grace in the waiting? No matter how long we are here on earth, there is purpose in our presence. God has a plan for every single minute of the life He has allotted us. He gives us a great commission; there are things to do, souls to touch and a magnificent God to glorify through our lifetime of waiting here for either our release or His return. Can it be then, that He also has a plan for us even in the mundane, hour-by-hour, day-to-day waiting of this life? What kinds of things is He teaching us as we wait to grow up, wait for a spouse, a baby, grandbaby, or retirement? Whose lives are we touching, impacting, BETTERING as we wait in traffic or in a line? How are we exalting Him while waiting to hear about a job, a decision, a prayer request, or good or bad news? The next time you are waiting, no matter what for, whether it is for mere seconds or many years, stop and think about the purpose in that wait. Is there a message He is trying to convey? Is there a lesson He wants us to learn? If we take the time during our wait to listen, to really HEAR Him, perhaps then and only then will we be able to glimpse the reason for our wait and maybe even discover the gift of His grace in the waiting. On this is so much my heart. And often after the waiting, I’m still not fulfilled by whatever I was waiting for. A purpose in the waiting-surrender and turning our eyes to Him. And oh how I wait for the future glory with Him forever! I’m your neighbor on Monday Musings. Amen! Thanks for visiting today, Melanie! Grace in the waiting, I like that. Patience is not one of my natural virtues. Working on it. Yup, me too! Keep up the good work, Donna, and thanks for stopping by today. May we wait patiently yet actively on the Lord, filling the time with prayer, studying His Word, and fulfilling His will for our lives where He has placed us. Beautiful post! Linked up with you at Tell Me a True Story — hope you’ll stop by Saved by Grace for a visit! Such a great addition, thank you! 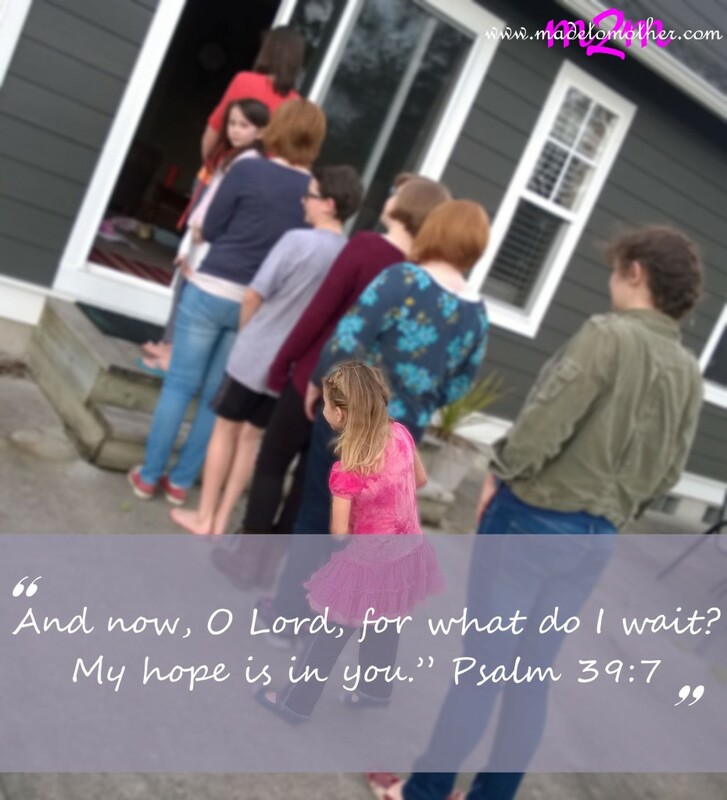 YES, fill that waiting with prayer and scripture. Thanks for reading today and I’ll be sure to visit Saved by Grace! Thank you for sharing with us here at “Tell me a Story.” Most of us ladies do NOT enjoy waiting, but it is a necessary evil. My daughter and I recently visited Bethel Church in Redding, CA, and planned to attend the Friday evening service. We went early just to check out the house of prayer, and then to inspect the church plant. We were amazed that an hour before service almost every seat was already taken, and we managed to find two seats together near the back. Waiting – Waiting for a church service to begin. We knew the hour it was supposed to begin, – – but NONE of know the exact time of Jesus Return. We are getting hints that it may be sooner than many think. We wait patiently for our Lords Return. I’m just coming through a very long waiting season. I did question God’s purposes in the middle of it. I knew He always had a plan, I just couldn’t see it. Thanks for sharing your thoughts on waiting at The Weekend Brew. This reminds me of a saying someone told me once – Present Moment, Precious Moment – even in the waiting. Thanks for linking with #SmallWonder. I always feel like I have to fill my time when I am waiting instead of asking the Lord what do you want me to do as I wait. Sometimes He said to wait without doing, most often He is perfectly able to give me something to do while I wait for Him to end this messy world as we know it and take us home. In fact I stand amazed that 68 years has passed in the waiting, busy, full and containing so many lessons from Him. I woke up today and realize He had not called me home in the night so there must be someone He wants me to talk to about Him. Lovely post. oh how I loved reading this today. Great message! Hi Wynter! There certainly is grace in the waiting but I feel too often we don’t allow ourselves the gift of the wait! Life is too hurried and too busy! The gift of waiting and being still and truly listening will provide the grace that only God can provide. Blessed by this post and always love when you link up at The Weekend Brew. Waiting. Oh.my.goodness. It’s such a battle at times. But you’re right. God has purposes in the midst. And it’s always beautiful on the other side of the battle. “And now, O Lord, for what do I wait? My hope is in you.” Psalm 39:7 <—- love it! Yes, sooooo beautiful and worth the wait, right?! Thanks for stopping by! Hi, I’m here from Wedded Wednesday. I’ve been told that I should be looking forward to heaven and all that, as I’m very ill, probably won’t recover, and am really kind of a downer as I’m in pretty awful pain much of the time. Puking blood doesn’t make me better company, I guess. However…to even put myself in the mindset of ‘waiting’ would, I fear, be something of a betrayal of the Almighty’s purpose for me here. He certainly set me a task, one which I try to meet every day (not always well, unfortunately). It deserves my best effort, and any weariness or longing for something else takes ‘me’ away from those small souls in my charge (we run a sanctuary for abused Pit Bulls), and distracts me from my job of blogging on Christian marriage. There’s enough in every day to fill my soul with grace, if I am open; enough, really, in every second. Wow, Andrew, I cannot even imagine. And I think you summed up the point of my post entirely. In the wait, whatever wait we are experiencing here, there IS divine purpose, a job and a calling. There is grace. Thanks so much for visiting M2M and I pray for God’s peace to be over you in your suffering. Omigoodness, me too, Lois! Sometimes I grasp so hard to find the purpose, ANY purpose in the wait that I miss completely His desire for my stillness and rest while waiting. Thank you for dropping by M2M today and for your sweet words! This is spot on! So many we get impatient and try to do things on our own then we wonder why things don’t work out. Waiting on God is difficult at times but so worth it. Thanks for the reminder. Yes, soooo worth it! Thanks for reading! Wynter, there is so much truth in this post. There is so much to be learned in the waiting. Not only are there lessons, but I have also found He most often changes me while I am waiting. We seem to think there is nothing which is happening while we wait. The truth is – there is more going on than meets the eye. May we embrace the wait & see His hand in it all. Blessings! Amen, some amazing changes in our hearts often happen in the waiting! Thanks for visiting today! Great, applicable scriptures! Thank you! This post is exactly what I needed today. Thank you so much for the encouragement. Beautiful post and wonderful thoughts. I am visiting from Katherine’s Corner Blog Hop. Thanks for sharing! What a wonderful reminder to praise our Lord, find joy, and contentment in our period of waiting. Well, yay, I’m so glad you did! Waiting on God’s plans, always brings great results. I learned to not pray for patience, though, because then He makes me wait longer. 🙂 Love this post!